This is the thirty-third issue of Voices From the Past. My goal for each issue is to publish some highlights of one of my historical stories as well as an update on my activities. Please feel free to forward this e-newsletter to anyone you think might be interested. Every U.S. Army soldier solemnly swears this Oath when they enlist. This is the story of one American soldier. His family moved to the United States in 1990 when he was eight. Then they sang the Star Spangled Banner, pledged allegiance to the flag, and proudly became naturalized American citizens. A few years later, when he graduated from high school, he thought of joining the Army. He told his family, �I have skills that few native born Americans have, skills I learned in our birth country that would be useful to the U.S. Army.� But instead he went to college, as his father wished. Then, that horrific day September 11th, 2001 happened. His sister later said, �September 11th kind of made the decision for him." Four days after September 11th, he joined the U.S. Army Reserve and solemnly swore the enlistment oath. While in Iraq, his unit came under heavy mortar fire and he had to sleep in his combat gear. During his furlough, Mohsin told a local reporter, �It was scary at times. But I knew everyone in the community here was praying for me." Some of you have probably done that � prayed for local people overseas in war zones. Mohsin also said, "It's still a little weird having running water." Mohsin returned to Iraq and served a total of nine months there. After graduating from college, he re-enlisted for active duty, solemnly swearing that enlistment oath again, and became a first lieutenant. �This is going to be my career,� he told his family. �The only way I'm getting out of the Army is if they kick me out, which isn't going to happen, or if I retire." In June 2008 when he was 26, Mohsin married a young woman named Raazia in her mosque in Colonie, NY � a town neighboring mine. Friends recalled that after the ceremony, Mohsin and Raazia were so happy and laughing all the time. As was planned, several days later, Mohsin left 20 year old Raazia and was deployed to Afghanistan, where he could use his special skills. Being a native of Pakistan and an Urdu speaker as well as a Muslim, he could communicate with Afghans and reassure them about American intentions. Staff Sgt. Jason A. Vazquez, 24, of Chicago, Illinois. They were among the 155 U.S. soldiers who died in Afghanistan that year. Mohsin was buried with full military honors after a solemn Muslim ceremony in the same mosque where he had been married only three months earlier. After the three rifle volleys and the playing of Taps, the American flag covering his coffin was ceremoniously folded and presented to his 20 year old widow, Raazia. 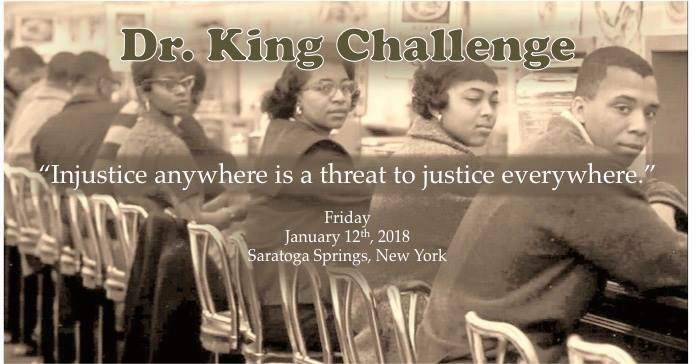 I am very honored to be one of performers at The Third Annual Dr. King Challenge in Saratoga Springs, NY, on Friday, Jan. 12, 2018. I will be telling the story about a 23 year old Muslim woman, born in Brooklyn, who gave hope in a time of fear, and who stood up for those who had suffered injustice. This story is on my latest CD Learning About Muslims. I was pleased to be part of 1st Night Saratoga, telling with my friends Siri Allison and Christie Keegan, calling ourselves Saratoga Storytellers. Our two sets were well received by some hearty folks who braved the way below frrrreeeeezing weather. I also pleased to be telling the story Stalking Her Prey: Congresswomen Martha Griffiths, the Mother of the Equal Rights Amendment at a meeting of the League of Women Voters of Rensselaer County. Thanks for reading this issue. I�ll be sending you some more story highlights in a few months. Click here to register for free copies of my future e-newsletters. Copyright 2018 by Kathryn Eike Dudding. All Rights Reserved.